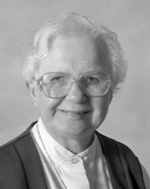 Sister Mary E. Cloran, I.H.M., died Feb. 26 in Camilla Hall, Immaculata, in the 54th year of her religious life. She was 73 years old. Born in Philadelphia, Sister Mary entered the Congregation of the Sisters Servants of the Immaculate Heart of Mary in 1958 from Nativity of B.V.M. Parish, Philadelphia, and professed her vows in 1962. She taught in various grade schools in the Archdiocese of Philadelphia for more than 30 years and for six years at St. Gregory School in Virginia Beach, Va. She entered Camilla Hall in 1999, first as a staff member and then as a resident. The funeral Mass was celebrated at March 4 at Camilla Hall. Father William E. Dean was the celebrant and homilist. Sister Mary is survived by members of her religious community; by her sister Patricia and a sister-in-law, Mary Cloran; nieces, nephews, grandnieces and grand nephews. She is predeceased by her parents, Henry and Edna; a brother, Henry, and an aunt, Sister Mary Marcella, I.H.M. and a cousin, Sister Regina Concepta Cloran, I.H.M.